This treatment is not safe for everyone so please check in with your doctor first. Warming socks is a form of hydrotherapy, a technique that uses water as a therapeutic tool to increase blood flow and lymphatic drainage, stimulate the immune system and encourage the elimination of toxins. It originated in Germany and has been used for over a century around the world with great success and is easily performed in the comfort of your own home. 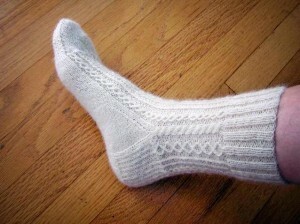 Warming socks involves putting cold wet socks on your feet covered with dry wools socks. I know it sounds terrible, but it is a powerful tool in helping your body overcome upper respiratory infections, decrease sinus congestion and to get much needed sleep. This therapy is actually calming and can be of benefit for those who suffer from insomnia or in children who are teething. Do not use this therapy if you have open sores on your feet or your overall constitution is weak. You must also be very warm before applying the cold wet socks to your feet. Take a hot shower, hot bath or soak your feet in a very hot footbath prior to the sock treatment. Complete all your bedtime routines so once the socks are on you can go straight to bed. Fill the bathroom sink with cold water and add a few ice cubes (adults only, no ice with children) and place a pair of cotton socks in the water. Have a hot shower, bath or soak your feet in hot water for at least 10-15 minutes. Wring out the cotton socks well and place on your feet. Put a DRY pair of wool socks on over the wet cotton socks. The socks will be dry in the morning and most people find they sleep better with the sock therapy. If you have any questions please call the office at 503-974-9283.